While we cannot make the app completely free, we have reduced our prices for our membership on the app to $10 for 1 month and $25 for 3 months. You can find even lower prices by purchasing on our website: $8 for 1 month and $20 for 3 months. 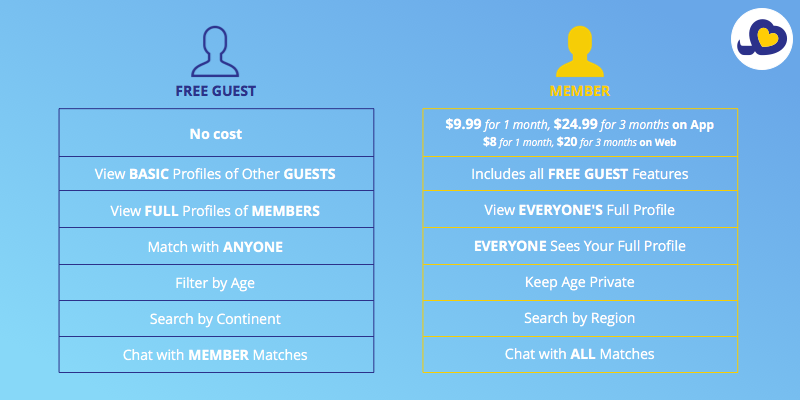 When considering our past premium features are now standard in our updated single membership level, these new prices reflect a greater than 50% reduction in prices on the app, and almost 50% off on the web, for the same features. Now all new users will get to use the app as a member for the first three days. This means that when you are first exploring the app, you get to experience key features, including viewing full profiles and filtering by geographical region. New users will now get a brief tutorial as they see their first potential matches. Current users can always access the instructions anytime in the Menu. Now that the app uses your local time, we had to set a time for when your five swipes would reset. We thought it made more sense to release the cards in the evening. Not only are you less distracted by the bigger tasks of the day come 6 pm, but now SurayeSwipe becomes something fun to look forward to as your day winds down.